Rereading the rest of the footnote I see, as is often the case with Sontag, that I have been thinking about what it contains for a long time without even remembering that she wrote it, and that I will probably now spend many more years arguing with myself about the details she’s included in what is for her a brief excursus. In any case, I now hurried to John Rewald’s History of Impressionism to read the chapter on the April 1874 show. The painters formed themselves into a group, not at all impromptu, carefully thought out and argued over, with the financial structure of a joint-stock company (Pissarro’s idea,) and a deliberately un-school-like name: Société anonyme des artistes peintres, sculpteurs, graveurs, etc. (Renoir’s idea.) Though the name Impressionism did arise from the show, it did so in a roundabout, emergent way, not because of a stroke of impressarial brilliance on the part of Nadar. The name came about through an odd mixture of the offhand, the laudatory, and the vituperative. 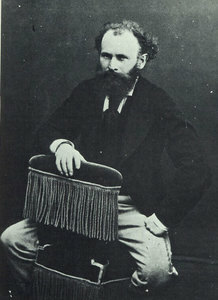 The catalog of the exhibition was edited by Renoir's brother, Edmond Renoir. Edmond Renoir remembered, in his unpublished recollections, that when he came to the group of pictures Monet had sent he was irritated by, "the monotony of his titles: Entrance of a Village, Leaving the Village, Morning in a Village...." Edmond Renoir objected and "the painter calmly told him: 'Why don't you just put Impression! '"[iii] A painting of Le Havre was called Impression, Sunrise, and critics, both the rare ones who liked the show, and the much more common ones who vied to outdo one another in piling up ridicule, seized the name “Impressionists,” which the painters themselves accepted as close enough. They weren’t hanging around Nadar and excitedly studying his photographs; they simply needed a space. According to Rewald: “This presented itself in the form of the studios vacated by Nadar, who, according to Monet, lent them the premises without fee.”[iv] Nadar’s biographer confirms that at this period, though he no longer maintained a studio there, Nadar still sometimes sublet the premises. He was fairly friendly with the group of painters, whom he saw now and again at the café Guerbois, but, she says, he stayed “hermétique” with regard to their innovations. He was a fervent admirer of Daumier and Guys – both dear to Baudelaire – but never collected the painters who were to become even more fully the "painters of modern life," as Baudelaire had described Guys in the long essay in which he envisioned a kind of painting. Baudelaire did write perceptively and admiringly about Manet, a figure with one foot in that earlier generation, and one reluctant foot in the Impressionist camp. But this earlier generation hardly threw themselves into promoting the new way of seeing made explicit in the pictures of Monet, Pissarro, Renoir, Sisley, Cézanne. Nadar may have known that the artists were penniless – if he lent them the studio for no charge that was a helpful generosity in a time when few were helpful to them. What the gesture meant, though, wasn’t that the buoyant, insightful, commercially adept, scientifically inquisitive Nadar saw the future and passed the mantle on to his comrades. The show was in a place left empty by a great, declining photographer of the previous generation. What I’ve been thinking about today is that it may be that the complicated relationship between Manet and the younger Impressionists, which has a strong bearing on the relationship between the movement of Impressionism and photography, could be expressed by these two now slightly refined facts: Manet was the friend of Nadar’s; the others got themselves named when they had a show in Nadar’s empty studio without Manet. [i] All Susan Sontag quotes from On Photography, New York: Farrar, Straus, & Giroux, paperback 1989, p92. [ii] Stéphanie de Saint Marc, Nadar, Paris: Éditions Gallimard, 2010, p203. [iii] John Rewald, The History of French Impressionism, New York: The Museum of Modern Art, 1973. Rewald is here paraphrasing and citing the unpublished recollections of Edmond Renoir, p318.